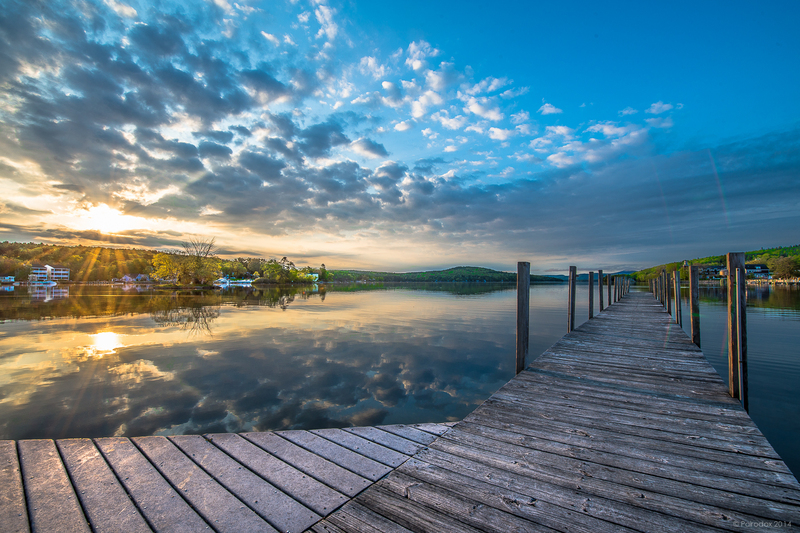 Whether translated from the Native American as smile of the Great Spirit or beautiful water in a high place, Lake Winnipesaukee is true to its name. I visited there last week and brought back a few images. This one was taken on Thursday morning. The forecast that day called for showers so I was up early, preparing for a run, when I noticed light through the curtain; imagine my surprise when I took a look and was greeted by the illuminating glow of sunrise through a low ceiling of broken clouds to the east. I tried to capture the view from the vantage of my second-floor window but the angles were all wrong and wouldn’t do; I made for the stairs. I stood for a bit and allowed myself time (though not much, for both sun and clouds were on the move) to enjoy the view. I have always been very much aware of the power of nature. At the risk of sounding trite I would argue that all natural environments, including woods, fields, the ocean, mountain tops and, in this particular case, lake shores have the power to help us to find our center in this experience called life. Standing at the edge of this massive body of water and looking out across its mirrored surface I was impressed by both stillness and silence. And then, as if energy emanated from the volume, I could feel its slumbering power. Forgive me if this sounds silly, but I have no other way of expressing it. Surely my friend Seonaid, at breathofgreenair, would be better able to put into words what it was I experienced and what is I’m trying to say. Perhaps what I felt was similar to a feeling I described in an earlier post in which I wondered why we find nature so awe-inspiring? I guessed then and still believe that we are predisposed to feel the power of nature because our ancient ancestors were directly impacted by it. Today, of course, we are protected from the elements, Earth, Water, Air, and Fire. In ancient days however, folks couldn’t run and they couldn’t hide for they lived intimately with nature and were a part of it. I am sure this realization instilled genuine fear at the thought of an advancing storm, a flash of lightning, or an immense body of water. We have learned, for better or worse, to circumvent the inconvenience that some would call nature. Perhaps our primitive fears have been transmogrified to find expression in doubt, awe, and inspiration when confronted with such a force. POSTSCRIPT: I wonder if anyone can find the surprises I discovered when processing the RAW file of this image for presentation here.